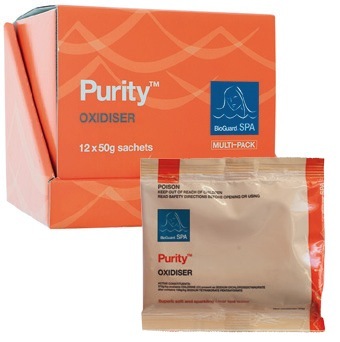 The combination of hot water and heavy use places a high demand on the oxidiser used in a spa. Even over a short period of time, spas can accumulate substantial waste material from a variety of sources, including the bathers themselves, animals, insects, pollutants and the general environment. These wastes cause the same problems that swimming pools suffer from, such as dull, cloudy water that’s irritating to the skin and eyes with an increased incidence of resistant algae. Regular oxidation is needed to break these wastes down. Due to their minute size, the particles that sometimes result are not capable of being filtered out without some form of clarifier. BioGuard SPA Purity is a unique patented blend of oxidising and clarifying agents designed to eliminate chloramines and musty odours.